The down loop airgybe is a pretty easy trick as long as you can jump and how to make a down loop with the kite. Just make the two tricks simultaneously and you will make a down loop airgybe. Let’s go through in detail what we´re doing here. Check that there are plenty of room down wind and approach with somewhat more speed than for a normal airgybe since the speed will help you to down loop more smoothly. Send the kite back to 12 and edge hard upwind to get some lift. To help yourself get airborne bend your back knee a bit as you would anticipate a jump. As soon as you feel the lift, do two things. Spring up off your back leg and start redirecting the kite from the side where it was coming. By getting the kite moving forward early on the downloop will be smoother and the kite will be ready for your command. As the kite lifts keep the bar in and wait. When you feel that you´re reaching the apex of the jump, move your front, right, hand to end of the bar. Or even better is if you can move your hand to the end of the bar as you get lifted to the apex. 8. 9. Now when you reached apex, pull like a mofo with your front hand and keep the bar sheeted in, don’t let go whatever you do. 10. As the kite loops it will pull you downwind. Keep yourself balanced by bringing your knees up, which stops your feet and board from being “left behind”. Keep the bar in and turn the kite. 11. The kite has now come through the bottom of its turn and is on the way back up, which means that you will start dropping down towards the water. 12. As you come into landing stop pulling with your right hand, but make sure that you keep tension in the lines. Spot your landing. 13. Just before touchdown, drop your legs and board underneath you, absorb the landing and point the board downwind. If you land with to much speed you might get to close to the kite which lines might start slacking. Be ready to sheet out the bar to get tension on the lines again. 14. 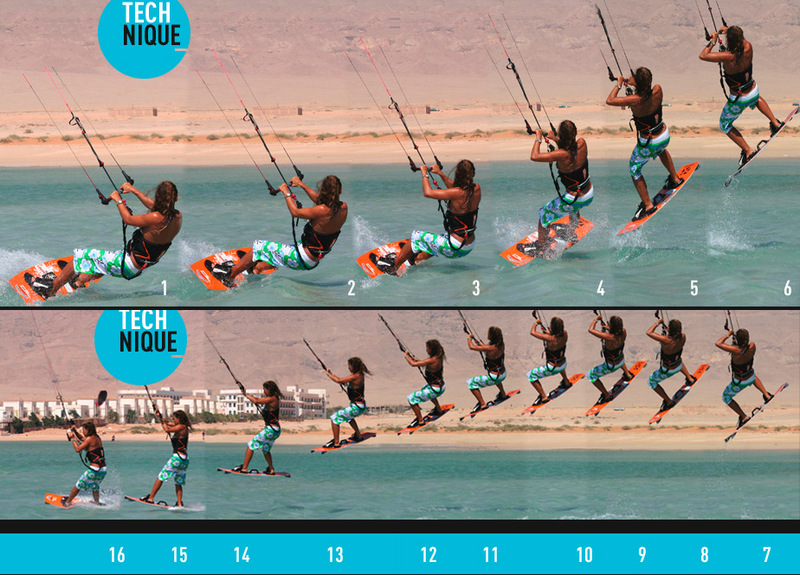 A good landing will soak up the speed but be ready to dive the kite down to the left to catch up more power. 15. 16. As you land carve back upwind to regian control of the kite and get back on the edge. As already mentioned spendning to much time running downwind will shorten the distance to the kite and the lines will slacken.